I'm moving in on some vacation time — a few brief days away at a favourite destination. I'd lived a long time without seeing the beautiful French River even though it was only a few hours away. It wasn't until my daughter met her future husband that I became acquainted with it. He, an avid outdoorsman, had been camping, portaging and fishing there for years. To say he met his match in our girl is an understatement. A 5', blue-eyed, blonde, she might not have looked rugged, but she certainly loved the life. Swimming at dawn in icy water, jumping into rapids, camping in the woods and doing what the bears most assuredly do there, was her idea of a perfect holiday. Add in the natural splendour of the picturesque French and the love affair wasn't just with her new beau. It was there that he proposed and there that they married. Their weekend celebration was our first trip to the French and like them, we fell in love. So much so that like them we return every year. Unlike them, however, we stay in a charming cabin, with incredible views and all the amenities. Though we love boating my husband and I certainly don't embrace the same active lifestyle as our girl and her guy. For us, it's the solitude and quiet, the retreat from daily drama, from cellphones and telephones, internet and email. As we exit the car upon arrival, I literally see my husband sigh, as his shoulders relax and his steps slow. We all choose something different in our vacation plans. Some want a busy time of touring and nightlife. Some long for rum-soaked days by the ocean, others margueritas by the pool. For us, right now, a little peace and quiet is all we need. 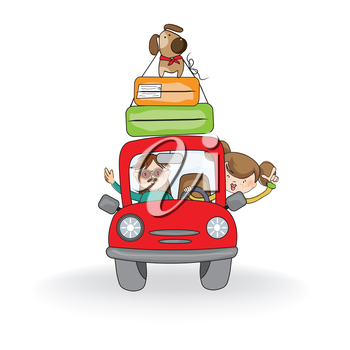 You can go on vacation with these wonderful clipart collections.